Metal veins in the Valsassina and Valvarrone valleys, a forest stand able to supply pit-coal to smelting furnaces, a largen nulmber of watercourses supplying motive power far machine operation, and a trading pIace such as Milan in the neighbourhood. 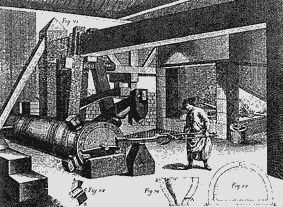 A successful concurrence of these factors laid the foundations of an iron processing industry in the Lecco area. Its oldest traces date back to Roman times. Studied by Leonardo da Vinci, this industry flourished in the time of the Viscontis and Sforzas. Supported by the enlightened governments of Maria Theresa af Austria and Jaseph II,.on mid 19th century the Valsassina valley’s iron metallurgy commenced a decline without recall. This was not the case with second processing metallurgical industry, concentrated in the lower Valsassina Valley and in Lecco, in the towns along the Vallata del Gerenzone valley, to which the manufacturing industry progressively moved. A comprehensive system of small drawing mills and forges was thus established, highly specialized and integrated in spite of splinter plants, which ensured a remarkable and diversified production of semi-finished products. 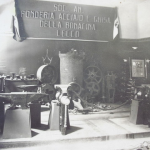 This was the time when three great entrepreneurial dynasties – the Badonis, Falcks and Redaellis linked their names to the iron industry in the Lecco District, and were the first to introduce new production technologies and to innovate the business organization in ltaly. When mechanics gained ground, at the outset of the 20th century, the foundations were laid for an intensive industrial development in the Lecco area, which played a main rate in the period after the second World War. A crescendo of spontaneous enterprises which redoubled thanks to a deep-rooted tradition, and a widespread entrepreneurial attitude: all this associated to skilled technicians and a group of active entrepreneurs devoted to innovation, who have launched the “Made in Lecco” label throughout the world, even in leading areas such as the aerospace industry. 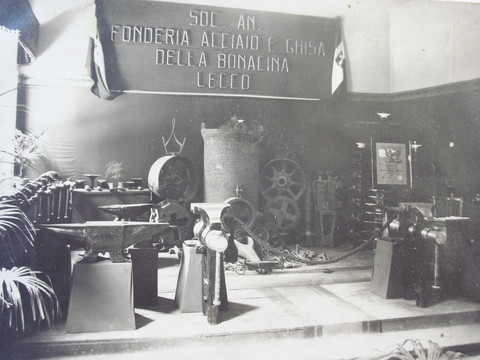 Starting early in the nineties, the characteristics of the products offered by Lecco’s mechanical industries changed considerably: only the stages with the highest added value were maintained and the range of production was reduced and shifted toward high quality products in areas less exposed to factors of depression. The entrepreneur went through a transition phase from the role of a mere technician to that of a manager, oriented toward maintaining the company extremely dynamic on the technological plane; this made it possible to achieve a greater opening toward foreign markets while avoiding direct competition on the provincial territory. In addition, the companies realised that flexibility and quality were no longer enough, but that it was necessary to have co-ordinated management of all the fundamental strategic elements: costs, innovation, service. One of the most significant changes that has occurred in these last few years has to do with supplier relations: in place of the generic relationship based on trust, typical in past years, there is more and more demand for rigorous reliability in deliveries and, more in general, in the procedures connected with orders. Attention to detail moves in step with the technical advantages offered by the new, impetuous growth of operating flexibility with computerised management, from design to storage, also for communications with international markets and adaptation to the most severe parameters of quality certification. Nowadays the main strong points of Lecco’s industrial enterprises can be identified by the presence of a widespread entrepreneurial culture, exclusive technical skills, high quality products and the ability to deal with markets through the potential of the entire “system”. Palazzo Belgiojoso, seat of the Lecco Civic Museums since 1927, it is today center of one of the Poles of the Lecco Urban Museum System (Si.M.U.L.) and it hosts three museums: Archaeological, Historical, of History natural and Planetary. It studies and documents the territory of the today’s Province of Lecco from the point of view of environmental and human history.